Holiday guests will enjoy their very own private retreat in the casual elegant atmosphere of the Grand West Villas, Nadi, Fiji. This locally owned Nadi accommodation provides families and couples with a truly relaxing, enjoyable and fulfilling tropical holiday in Fiji. The self contained two story 2 bedroom accommodation apartments are positioned on a large manicured garden and come complete with full cooking facilities, 2 bedrooms, air-conditioning, ceiling fans, phone, television, stereo and maid service. The Grand West Villas, Nadi also offer studio and 1 bedroom well appointed and air-conditioned fully serviced apartments. 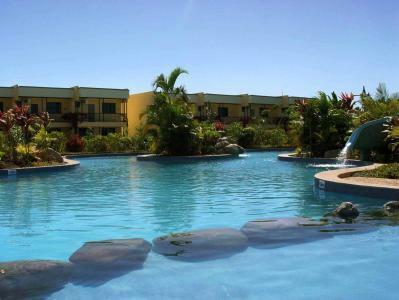 There is also a spectacular swimming pool with water slide, tennis courts and other recreation facilities at the Grand West Villas Fiji. The friendly staff can also help you with any travel tips that you may need about Fiji. This discount Nadi accommodation is only 10 minutes away from the Nadi International Airport and Nadi town centre, whilst the Nadi Bay beach, Nadi Airport Golf course, sea plane and Boat Club are just a short 6 minute walk away. There are a number of things to do at the Grand West Villas including swimming in the spectacular pool, enjoy the waterslide, hone your skills on the tennis and volleyball courts, walk around the magnificent tropical gardens, walk to the beach and enjoy a swim in the Pacific Ocean, see the tour desk for day excursions to Highlands and Fijian Villages, Scuba diving, snorkelling, fishing or day trips to other islands, explore Nadi town shopping or golf at the Nadi golf course.